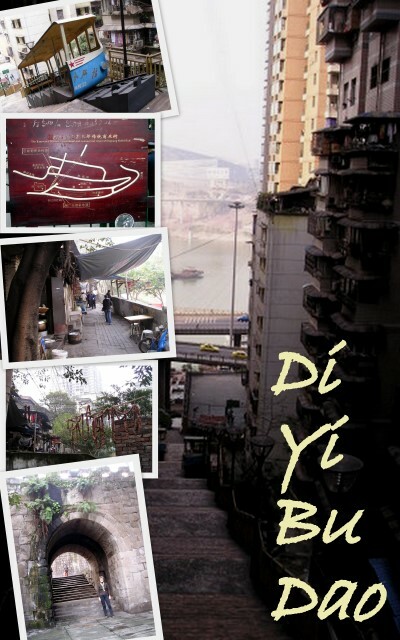 Walking is by far the best way to explore most cities but in Chongqing it really is the only way to go. Tucked away in the labyrinth of narrow alleyways and steep stairs you'll discover lots of interesting places. These old and worn flagged stairways have a thousand tales to tell if only they could talk. A recent walk along the Di San Bu Dao revealed a lot of changes, especially the demolition of the French Hospital building (Ren Ai Tang) which was in a very bad state of disrepair. The section of the walk near Shibanpo (Guanyinyan) is still a little hard to find and only the lower walkway is open which means a few stairs to climb back up when you arrive at Chang Jiang Bridge. 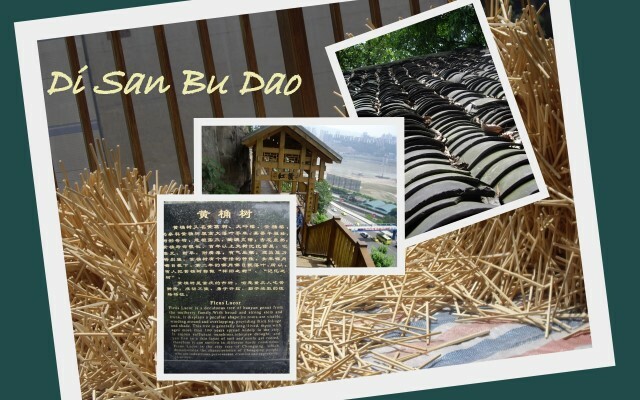 However, the old Water Tower is clearly visible from Xinglong Jie and if you're prepare to explore you'll also find the PuTi Jin Gang Tower hidden away off Chun Yang Dong which runs off Pipa Shan Main St. Look for the paving stones marked Di San Bu Dao and follow them. 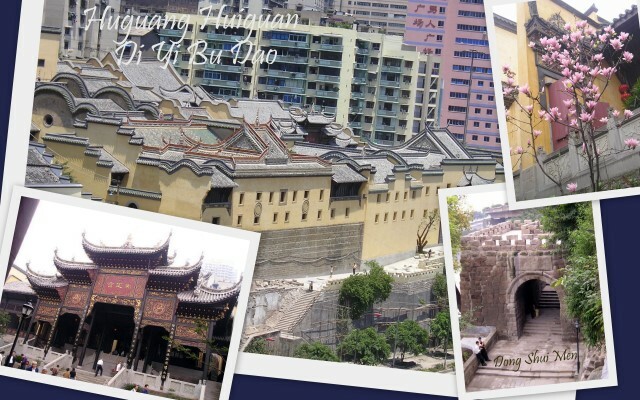 Chongqing was once a walled city but unlike most Chinese walled cities the original Ming walls followed the steep and irregular topography of the peninsular formed by the two rivers that cut through the city. Today, just a handful of the original eighteen gates of the city wall still stand and the Dong Shui Men East Water Gate is the most intact of them all. Chao Tian Men 朝天门 (Turn towards Heavens Gate) on the tip of the peninsular is the most famous of the city's gates and has been rebuilt. Today it is hidden beneath the viewing plaza where you'll find a map of the layout of the city wall, gates, temples and ancient buildings. The new 1 Planning Museum unveils bold plans to redevelop much of the older sections of the city. A walk can commence at any of the remaining gates but is best begun from Chao Tian Men (see map) walking upstream along the north bank of the Yangtze towards 2 Dong Shui Men 东水门 and the beautifully restored 3 Huguang Huiguan 湖广会馆 (Guild Hall). From here continue walking to the left of the Huguang Huiguan up the slope via 5 Wang Long Men 望龙门 towards 7 Chu Qi Men 储奇门 - The gate is no longer here but there's an interesting set of stairs which climb up to the archways supporting Kaixuan Rd. Only one of the archways is open, the others are boarded up or have become houses hidden beneath the road beside the Chongqing Daily Newspaper. 8 Kai Xuan Elevator covers the same climb just beside this gate from Xinhua Lu to Jiefang Xi Lu. Continue via the 9 Wartime Air Raid Bunker outside Deyi Department Store on to the viewing platform at Jiao Chang Kou where you can enjoy a cup of tea at the quaint 10 Eighteen Stair Teahouse on Zhongxing Lu before strolling along the 13 Di San Bu Dao 第三步道 which begins on Mati Jie and Shan Cheng Xiang past site of the 15 French Benevolent Hall, Hospital and a church near 16 Jin Tang Men to 18 Shi Ban Po 石板坡. 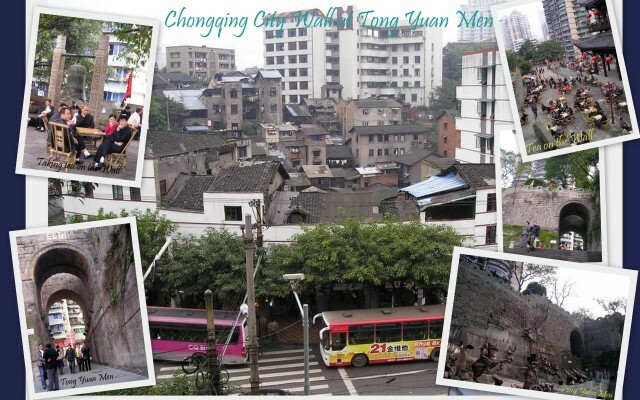 From here switch back along the bustling market street of XingLong Jie to 19 Tong Yuan Men 通远门 on Zhong Shan Yi Lu at 20 Qi Xing Gang 七星岗. This, the most visible of the cities old gates is a well restored section of the city wall with a bronze sculpture of an historic battle in full swing. Tea houses and galleries straddle the wall and this is a popular spot for locals to spend leisurely and balmy summer days. To complete the city wall walk continue down hill past 21 St Josephs Catholic Church on the left, through Lin Jiang Men 临江门 and back to Jiefang Bei, Jiao Chang Kou or Chao Tian Men. 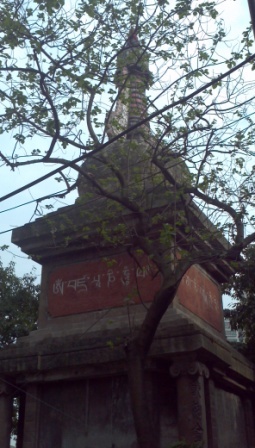 This city walk begins at 25 Qian Si Men 千厮门 on Mian Hua Lu near the Carrefour in Jiefangbei, visit the 26 Arhat Temple and follow Mingzhu Lu, the narrow old street via Chao Tian Men Wholesale Markets. Cross Shanxi Lu where you'll find a map on the footpath and follow the stairs down Dong Zheng Jie to 2 Dong Shui Men 东水门 beside the 3 Huguang Huiguan 湖广会馆 a distance of 3 kms. Qian Si Men is the site of one of Chongqing’s original feniculars which carried passengers up the steep banks of the Jialing River into the town. 23 Hong Ya Dong and the 24 Cable Car across the Jialing River are situated nearby and may be included on this walk. 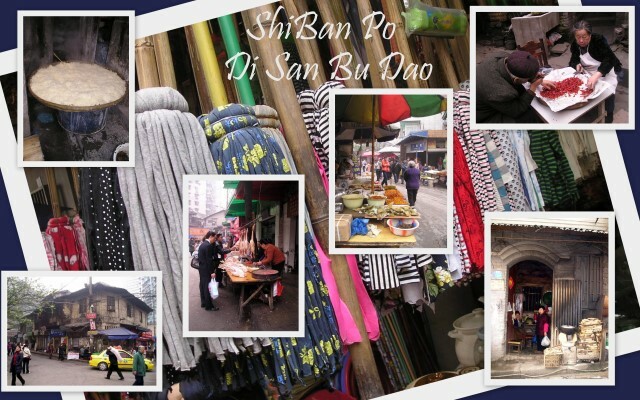 13 Di San Bu Dao is the first of several city walks which begins at the bottom of ZhongXing Lu from Mati Jie beneath Jiao Cheng Kou. Following the carved flagstones this walk hugs the steep slopes of Yu Zhong Peninsular to Shi Ban Po above the northern approaches to the Chang Jiang Bridge. This walk takes you past a several of the Mansions of China's war time leaders and merchants, the Ren Ai Tang, the French Benevolent Hosptial and a church which is still in use today as an old people home. Allow 2 hour. Covers sites 13 - 18. 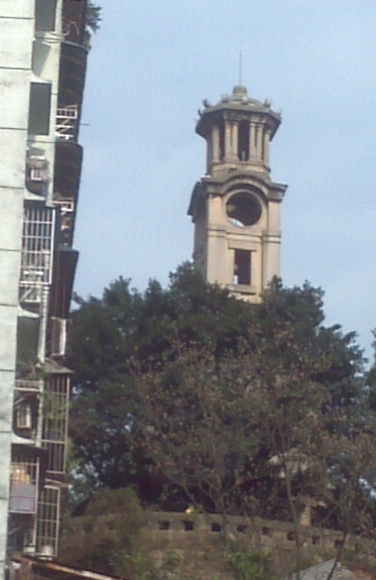 This was one of the oldest remaining remnants of Old Chongqing and the majority of this area was demolished late 2009. It consisted of a cluster of traditional stilt houses, steep stone stairways and flagged stone alleys clinging to the steep slopes overlooking the Yangtze River Bridge.